Twenty-year-old Ryan Karsner is surrounded by rocks. 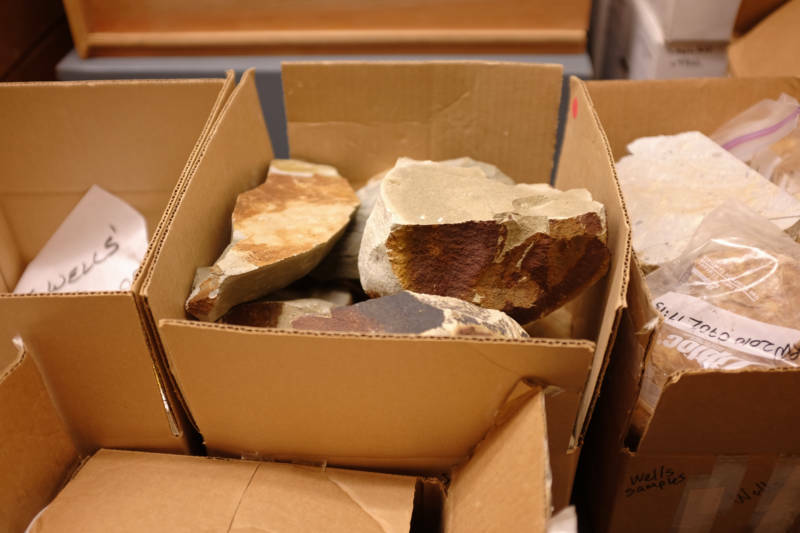 Thousands of them overflow from boxes and cabinets in a cramped storeroom at the U.S. Geological Survey in Menlo Park, Calif. The rocks range from rust-hued sandstone to smooth grey basalt. Some have been collecting dust in rooms like this for more than 50 years, until now. Ryan’s task is to catalog the collection into a massive spreadsheet. He might seem like your typical college-aged research assistant. He’s dedicated and enthusiastic about science. But Ryan has struggled with autism his whole life. In elementary school, he had trouble with the most basic math and reading. Ryan’s teachers told his family he would be lucky to one day work at a 7-Eleven. Now he helps scientists conduct important research. 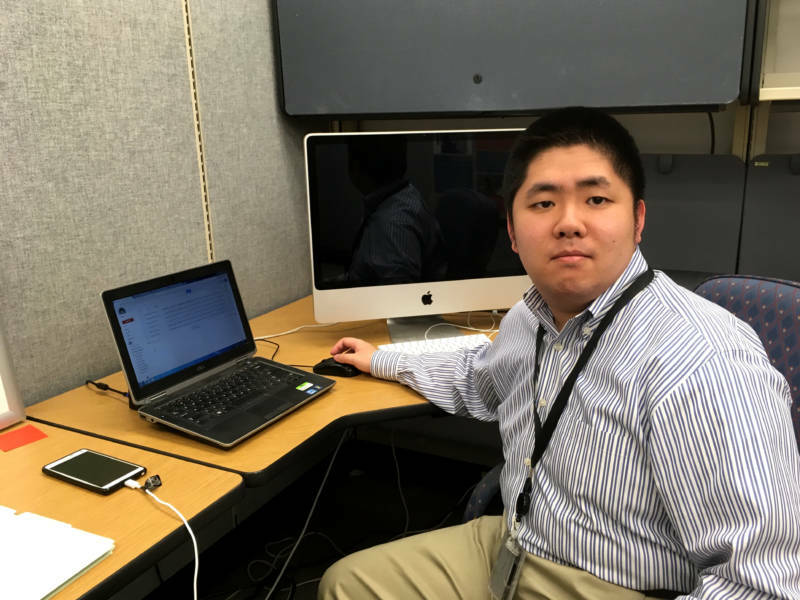 Ryan is one of 12 Bay Area students participating in a new job training program called STEP-UP, or Secondary Transition to Employment Program – USGS Partnership. The program pairs young adults with autism and other developmental disabilities with scientists to assist with research projects. The students, aged 18 to 22, volunteer at the agency’s headquarters in Menlo Park a few times a week, and receive a stipend from the state. 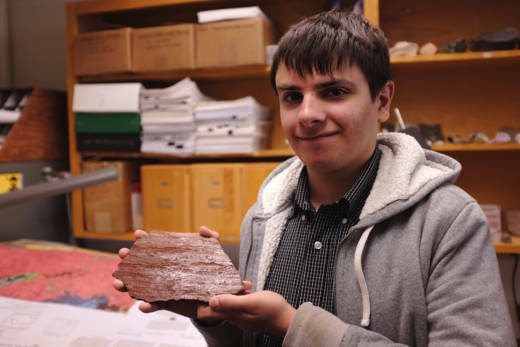 USGS geologist Scott Bennett says that since the program launched in January, the STEP-UP students have made an “invaluable” contribution to his work. Bennett is in the map-making business. 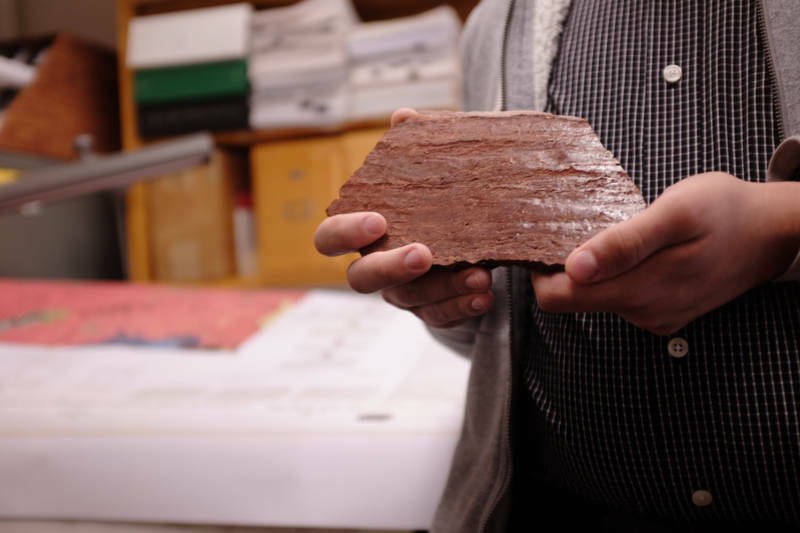 His lab uses rock samples and field measurements collected throughout the Pacific Northwest to locate geologic hazards like fault-lines and landslide-prone areas. “It’s not glamorous work to be honest,” Bennett says of the archival project the students are undertaking. But it’s essential to the preservation of their data. For Ryan Karsner, whose passion is the outdoors, the opportunity is a chance to do something meaningful. Ryan’s parents, Janine and Richard Karsner, learned about the STEP-UP program from a teacher from Santa Clara Unified School District. Ryan came a long way since elementary school, but at 20, he still doesn’t have a high school diploma. Without clear college or job prospects on the table, his parents worried about his future. “When you have a special needs child, your options a lot of times are limited, and you don’t know what’s out there,” Janine Karsner says. This is real concern for families like the Karsner’s. The unemployment rate for autistic adults is more than 15 times the national average — even though the majority don’t have impaired intelligence. This can fuel anxiety and depression in a group prone to emotional distress. 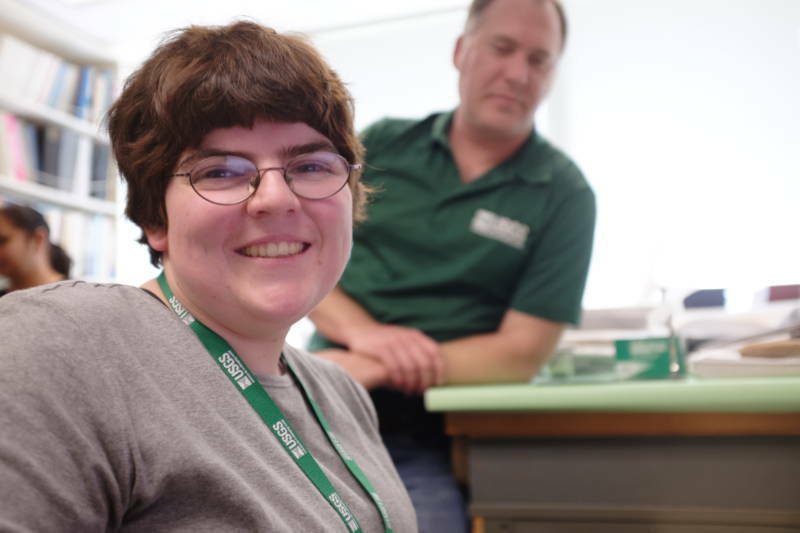 Federal law requires public schools offer job training to students with disabilities. Melissa Mitchell, the teacher who told the Karsner's about STEP-UP, says this mandate doesn't come with funding. It's left up to the individual school districts to develop and, for the most part, pay for programs out of their already strained budgets. This limits the number and variety of what's offered. The Karsner's found that most programs prepared students for simple tasks like folding laundry or bagging groceries. While beneficial to many, Richard Karsnser says these one-size-fit-all options overlook the potential people like his son have to contribute to a workplace. STEP-UP, he says, is different. Richard still remembers the first day his son came home from the program in January. He couldn’t stop talking about a particular rock. While new to California, the program was pioneered in 2012 at USGS’s main office in Reston, Virginia. It proved so beneficial to students and scientists, the agency decided to expand it. Chris Hammond, who manages the program for USGS, says he’s been amazed by what students have been able to accomplish. Data entry, archiving, and digitization make up the bulk of the tasks assigned to the students. Hammond says the error rate of most people USGS hires for this type of work is around three percent. The STEP-UP cohort in Virginia averages point-three percent. The students often find mistakes in other people’s work. “They do things that neurotypical people just wouldn’t have the time, patience or attention to detail on,” Hammond says. When students turn 22, they age out of STEP-UP, and many of the services offered to autistic people. 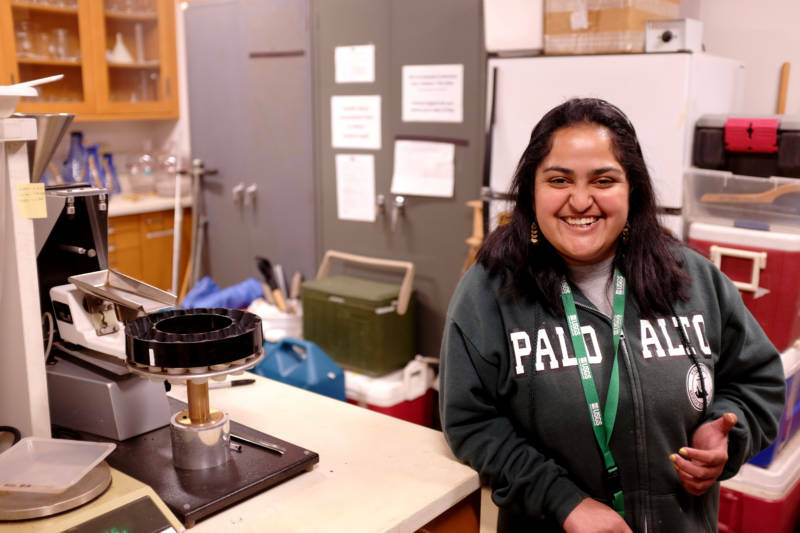 So far, USGS in Virginia has hired four out of the eight students that have graduated the program as part-time employees. So, what is the key to unlocking the potential of someone on the spectrum? 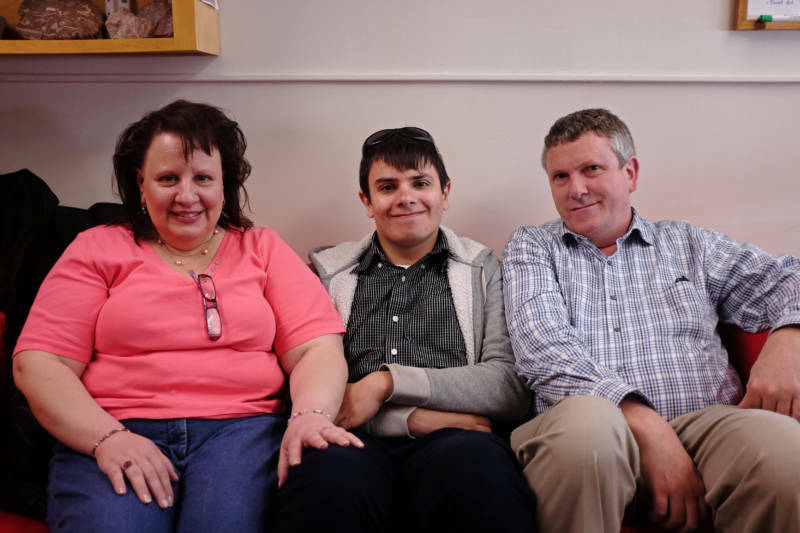 Journalist Steve Silberman got to know hundreds of young people with autism for his book NeuroTribes. He says each one is passionate about something — whether it’s Pokemon or computer games or collecting rocks. The interests of autistic people can seem like obsessions. “It turns out that the obsessions or, if you will, passionate interests, of autistic people often provide the basis of a career or a pathway forward,” Silberman says. Traits associated with autistic people, like hyper-focus and repetitive behavior, can translate into them becoming hard-working, detail-oriented employees. Vocational training programs like STEP-UP play a big role in this. They help young people with autism figure out what they like, and what they’re good at. They also teach employers the value of their skills and how to work with them. Without the chance to put their abilities to use, autistic kids can find it difficult to transition to adulthood. Stanford psychiatrist Antonio Hardan has been treating autistic children and adults for over 25 years. He says there’s a growing awareness of the hidden potential of many people on the spectrum. “The sky’s the limit, if you find an area that matches the person’s interests,” Hardan says. Hardan says local, state and federal governments need to put more financial backing behind these resources. He’s looking to universities like Stanford to lead the way in developing programs. It’s still to early to tell whether Ryan Karsner will have job waiting for him at the end of the STEP-UP program. Scott Bennett from USGS says he hopes they’ll be able to keep him on to finish the rock archival project, and maybe even get him out into the field to collect samples. Regardless, Ryan says the experience has him rethinking what’s possible. He’s realizing he can, “be somebody that I want to be,” instead of have everyone tell him what he can’t.